The Supreme Judicial Court unanimously found that the legal rule that erased Hernandez's conviction is "outdated and no longer consonant with the circumstances of contemporary life." It ordered that Hernandez's conviction be restored and that the practice be abolished for future cases. The ruling does not affect past cases. The former New England Patriots star was convicted in 2015 of killing semi-professional football player Odin Lloyd. Two years later, the 27-year-old killed himself in his prison cell days after being acquitted of most charges in a separate double-murder case. "The SJC did not state a cogent reason for applying this new rule to Mr. Hernandez's case, and there is no reason in the record that justifies that aspect of this decision," John Thompson and Linda Thompson said in a statement. Prosecutors argued that the legal doctrine is outdated and unfair to victims. Quinn told the court that the defendant's estate should be allowed to appeal the case, if they wish. Otherwise, the conviction should stand, he argued. Under the new rule laid out by the court, the conviction will stand, but the court record will note the conviction was neither affirmed nor reversed because the defendant died while the appeal was pending. 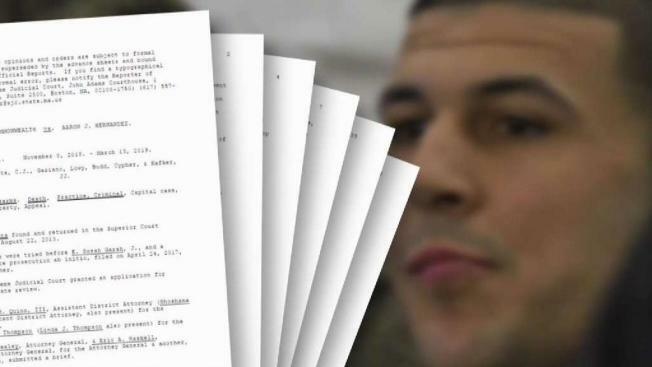 Lloyd's mother settled her wrongful death lawsuit with Hernandez's estate in September. A lawyer for Lloyd's family said Wednesday that they are pleased with the court's ruling. "This decision has helped the family to obtain closure from the horrible loss of their beloved son Odin," Attorney Doug Sheff said in a statement. "He was an inspiration to all who knew him and a devoted member of his family and the community. It has solidified their faith in the Massachusetts Justice System."